Last Friday, I took Alex to the Pumpkin Prowl at the Woodland Park Zoo. The Pumpkin Prowl is a fundraiser for… actually, I don’t know what it’s a fundraiser for. Does it really matter? Kids parade through the zoo in costumes. Even if they were raising money for Dr. Evil’s Foundation for World Conquest, we’d go anyway. We met one of Alex’s school friends at the zoo. Unfortunately, last Friday was Patrick’s first day of fever, so neither he nor Molly joined us. We’re lucky we found parking at the zoo. We had just a small hike from one of the west parking lots to the south entrance. 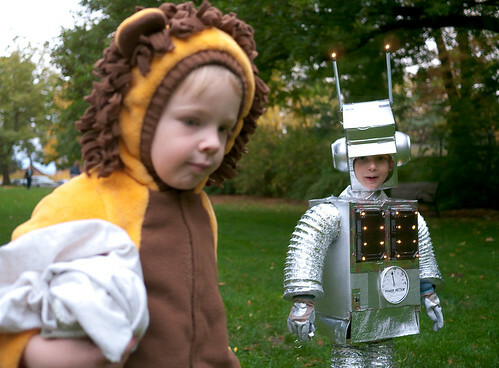 On the way, Alex (in his Gymboree lion costume) starts walking next to another little boy with the best homemade robot costume ever. It had lights. Every parent we passed stared in open admiration at the robot and oohed-and-aahed over him. 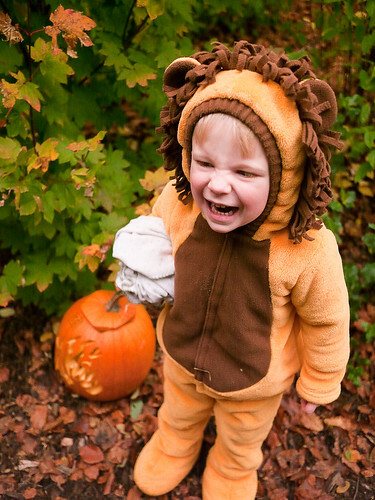 Our cute little lion only got passing attention from the other parents, when they thought the two kids were going to the zoo together as the Tin Man and the Cowardly Lion. I now know what it feels like to be the plain girl who’s best friends with the homecoming queen. I don’t know if it’s because Alex and the robot were about the same size, but the two of them really hit it off on that short walk to the zoo entrance. They talked a lot, walked next to each other the whole way, and even introduced themselves (although I didn’t catch the robot’s name). And then, just like that, they parted ways once they entered the zoo. Didn’t think anything of it. Only preschoolers seem to make and forget friendships so quickly. There’s an entertainment stage set up near the zoo entrance. That’s where we met Alexa, who was dressed as a pink butterfly. When we met, a young ballet troupe was performing some strange dance routine on stage. (I’ll admit I’m not a dance person, so all dance is “strange.”) They hadn’t attracted much of an audience, but our two preschoolers were fascinated and stared at them until they left the stage. Alex and Alexa watch the ballet troupe. 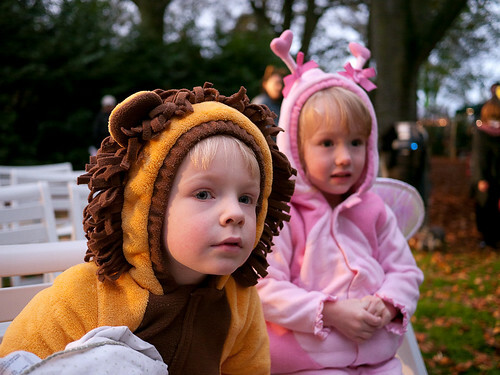 With the dance distraction gone, Alex and Alexa set off on their next conquest: Trick or treating. There were about a dozen trick-or-treat stands set up around the zoo, each sponsored by a different local business. Both kids mastered an enthusiastic “Trick or treat!” battle cry before swooping in to seize candy. Surprisingly, I didn’t have a hard time convincing Alex that he couldn’t eat all of the candy that night. He seemed happy just collecting it into his bag. 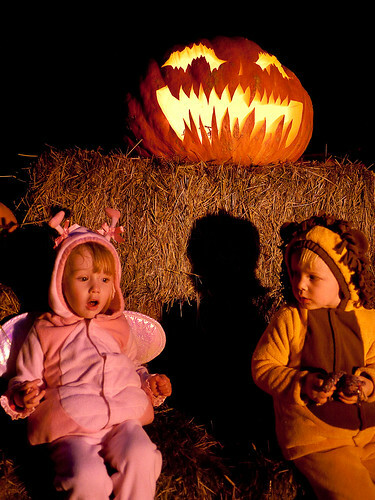 During the Pumpkin Prowl, most of the zoo grounds are closed. They keep everyone moving along a pumpkin-lined loop that leads from the south entrance to the Zoomazium and then back again. And for the Pumpkin Prowl, the Zoomazium gets transformed to the Boomazium, a small and not-very-scary haunted house. (Very appropriate for a preschool audience.) The most challenging part of the whole trip was convincing two three-year-olds to wait in line for the Boomazium. They couldn’t understand why they couldn’t just stroll past everybody and go right in. Waiting to get into the Boomazium. All in all, it was a successful trip. Even days later, Alex was still talking about it. Hopefully we can get Patrick out to it next year! Even fearsome, roaring lions need blankies. 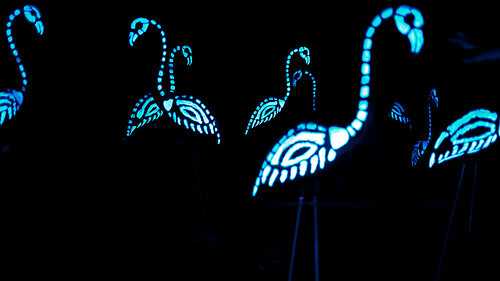 Spooky flamingos at the Woodland Park Zoo’s Pumpkin Prowl.